Snow Flurry Sketch – Let's Paint Nature! Not feeling well, but desperately wanting to sketch, I stopped by Lake Katherine to do a quick one while sitting in my car. The snow was falling at different rates; sometimes slow and then all of a sudden quick and hurried, just to return to a quiet, slower pace. I love snow. 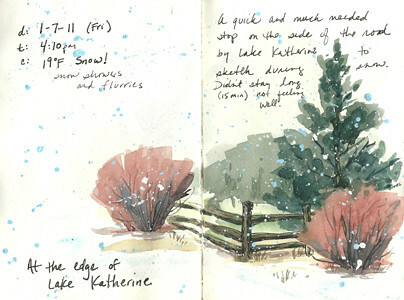 Try watching snow fall while listening to classical music, sipping a mocha from Caribou Coffee, and painting…..heaven! Anyway, while sitting in the car, I did the bare bones of the sketch. Just concentrating on the colors and the shapes, I only painted for 15 minutes, driving home with my sketchbook open to dry. After I got home, put some jammies on, I painted a second layer on the pine tree and the fence. When dry, I outlined the fence with a black micron pen. I took some blue and white gouache and splattered the snow with an old toothbrush. That part is SO MUCH FUN! Be careful though, splatter gets everywhere! Try doing a quick sketch, don’t worry about details, just get simple shapes and colors down. You will be surprised at how easy it is to do! Absolutely beautiful and so inspiring……. Not being a painter as I have noted here before, I have for what ever reason felt fairly at ease to show my ignorance with regard to painting on your blog. That’s a good thing I suppose. Now….your last two posts have featured works involving ‘snow’ and I’m not sure why but I have begun to wonder if it is actually difficult to paint ‘snow’? Some might think that a ridiculous question but I wouldn’t think you could just smear (or paint) a bunch of white color on the canvas and call it snow. Hello was going through flicker and found the watercolor journal group this lead me to your flicker page and blog. Thank you so for having so much wonderfulinformation. Im teaching myself and just started journaling everyday and watercolor. There is nothing here where I live to go to a class and the internet is the only thing to learn from and of cours books dvd ect. Your lessons are wonderful for someone like me when you live on a low budget you cant always get art supplies as readily as you would want. Please have info on tree foliage and land scapes . Christine, I cant hank you again for having this blog. i’m teaching myself watercolor and this blog is going to helpme understand how to do things. When your own a budget and cant get supplies or go to classes your at a loss when your a visual person and youre viseo was so helpful for me. Imin hopes youll have more and on tree folige flowers ect. Thank you again for the time you have put into this for us. Beautiful sketch–very inspiring that you did this in your car and finished up at home. Gregorbucik: Thank you very much! Lana: Come on now, you know you love it! HA hA! Holly: Thank you! It’s so much fun to do and share. Alan: What a great question! Yes, you are correct when you say that it’s probably not a good idea to just smudge the white and call it snow. People sometimes think snow is tricky because they think snow is white, however snow reflects everything around it, so it’s not just white but it is pink, blue, and purple in the shadows and orange if the sun is setting! If you are painting with oils, acrylics, or pastels you would need to add color to your white on the canvas. With watercolors however, there is no white paint. You have to let the white of the paper show through when painting with watercolors. For snow, I allow the white of the paper to show through and then highlight it with a pale pink, blue, or whatever. I hope this helps. Linda: I am so glad this site is a great help to you!!! I can not take all of the credit, as God has given me this talent and I believe my job is to help people by providing art lessons. Which brings me to my next point that with God nothing is impossible, he will provide a way for you to get supplies and instruction..He doesn’t even need our money! Yay! I’m glad nothing has prevented you from practicing in your journal everyday, great job! You will grow quickly as an artist that way. Keep up the great work and never stop.